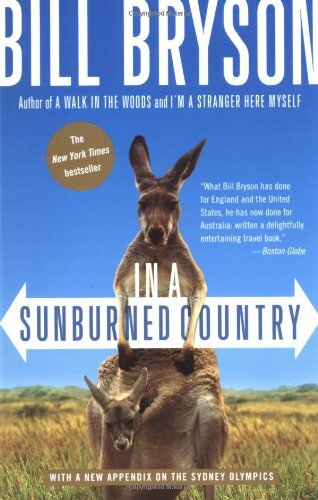 Every time I read this book it reawakens in me a longing to visit Australia. I want to see literally every place Bill Bryson visits. I can’t get enough information about the animals and plants (whenever I reread it, my Google search history is full of tingle trees, potoroos, cassowaries, and box jellyfish). What is it like to ride on the Indian Pacific, or see the Great Barrier Reef, or visit Uluru? What’s it like to live in Perth, the most remote big city in the world (I’m so obsessed with Perth)? Is Canberra REALLY as boring as Bryson says? And are there seriously six foot long earthworms in Victoria? Australia is fascinating and there is still so much there that is unknown. It’s an exciting place. I love this book because Bryson’s enthusiasm for Australia is infectious. I’d never really thought much about Australia before reading it, but he succeeds in making it a place you’re dying to go. I read a lot of nonfiction, but I think this is the only book where I’ve ever gone through the bibliography and made a reading list. There are a few quibbles–it was written almost 20 years ago, so some of the science stuff is out of date. I think more of the book could be devoted to Indigenous Australians. But other than that, I love this book. I’ve read it a million times and I’m never bored by it. Share the post "The Wide Brown Land"
I live in Perth, Australian born and bred. We’re always in the top 10 of most liveable cities and love to spout that line about being the most isolated capital city in the world (lack of good bands making the journey and inflated ticket prices being the main drivers of that conversation) – but it absolutely amazes me that someone would be obsessed with Perth. Is this an obsession through Bryson? Have you visited and fallen in love? PS: yes, Canberra really is that boring. Basically only politicians and prostitutes live in Canberra (arguably, these are the same people). Never been, but I’ve wanted to visit Perth ever since I first read this book. I’m obsessed because it sounds like a beautiful city, first of all, but also because if its remoteness. You have to cross a desert or an ocean to get there! You have to REALLY want to go there because it’s a lot of work to travel to. It’s so interesting to me and I hope I someday can afford to go to Western Australia. Or ANYWHERE in Australia.